Yokogawa has combined its world-leading expertise in power measurement and its long heritage in oscilloscope design to create the world’s first Precision Power Scope: the PX8000. The PX8000 brings oscilloscope-style time-based measurement to the world of power measurement. It can capture voltage and current waveforms precisely, opening up applications and solutions for a huge variety of emerging power measurement problems. The PX8000′s power measurement capabilities are supported by Yokogawa’s reputation for measurement accuracy, stability and repeatability. 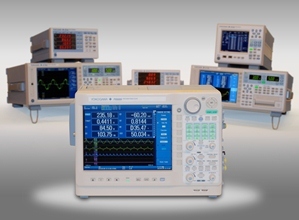 The instrument also offers ease of use and a short learning curve thanks to features familiar to users of Yokogawa’s existing families of power analysers and oscilloscopes. The PX8000 is powered by Yokogawa’s isoPROTM technology, which offers industry-leading isolation performance at the highest speeds. isoPRO core technology, designed with energy-saving applications in mind, delivers the performance needed to evaluate high-efficiency inverters that operate at high voltages, large currents and high frequency. Applications for the PX8000 cover everything from sustainable power to advanced robotics. Any situation where power consumption is at a premium – which means almost anywhere power is consumed – can benefit from the introduction of the PX8000′s precision measurement and analysis capabilities. Typical application sectors include inverter and motor testing, reactor loss measurement of inverter boost circuits, transient responses of industrial robots, wireless charger efficiency measurement, and voltage and power measurements in electricity distribution systems.